Angie Smart has been a First Violinist with the St. Louis Symphony since 1998. Originally from England, she began violin lessons at the age of six and won a scholarship to study at the age of 13. She continued her studies in the U.S. where she attended the University of Miami, Lamar University in Texas, and completed her masters degree at Rice University in Houston. Ms. Smart has performed extensively in Europe and the U.S. with representation by Encore Concerts, and has appeared as soloist with the St. Louis Symphony, Alhambra Chamber Orchestra, Gorton Philharmonic, and Lamar Chamber Orchestra. Her television appearances have included masterclasses with Yehudi Menuhin and as the subject of a documentary. Among other masterclasses, she has played for Midori and Zachar Bron. Ms. Smart has participated in summer festivals such as the Sun Valley Summer Festival and the Missouri River Festival of the Arts, among others. She has been a Pro-Am Coach and performing artist for MOCM since the inaugural season. 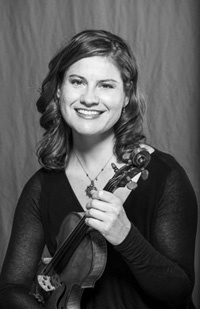 Ms. Smart has competed in the 10th International Tchaikovsky Competition and the Yehudi Menuhin Competition, and has been a prizewinner in many other competitions, including the British Violin Recital Prize, Elizabeth Harper Vaughn Concerto Competition, and the William C. Byrd Young Artists Competition.